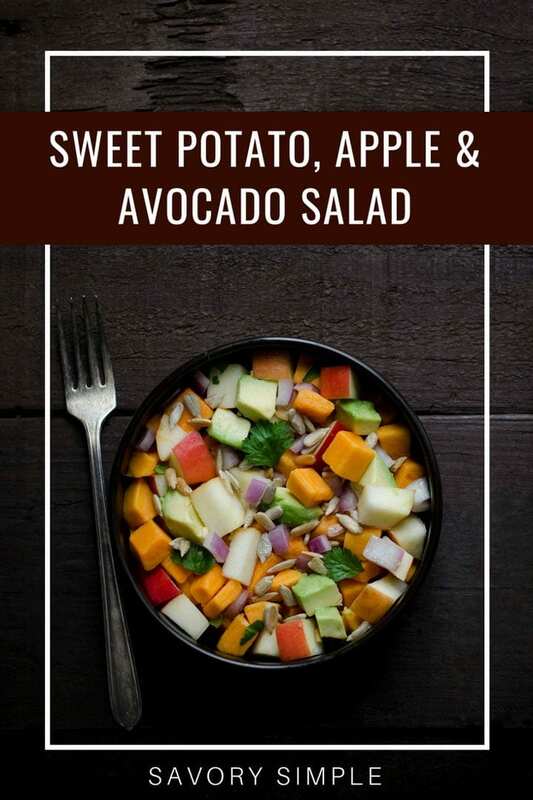 This refreshing sweet potato, apple and avocado salad recipe is a healthy lunch that’s bursting with flavors, textures and colors. For those with dietary restrictions, it’s gluten-free, grain-free, vegan, and paleo. As for the rest of us, it’s an incredibly tasty, satisfying meal. I’m not one for New Years resolutions, though I do like to set a few business and personal goals every year. Is that the same thing? Probably… I just don’t call them resolutions. They’re goals! Anyway. I never resolve to change my eating habits, but I always feel gross after the overindulgence of the holidays. So I just want to eat healthier by default, at least for a few weeks. 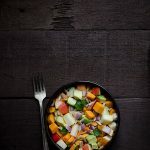 I’ve been dipping into my archives, and this sweet potato, apple and avocado salad has been exactly what I need lately. The sweet potatoes and apples help to satisfy my sugar cravings, the avocados add creaminess, the toasted sunflower seeds add crunch and a nutty flavor… there’s so much to love. I’m such a fan of this salad that I included it in my 2016 cookbook, The Gourmet Kitchen. Today I’m republishing it and updating the recipe notes with more details so you can enjoy it as well. The smaller you cut the sweet potatoes, the faster they’ll cook. You can either boil or steam them; it takes the same amount of time. 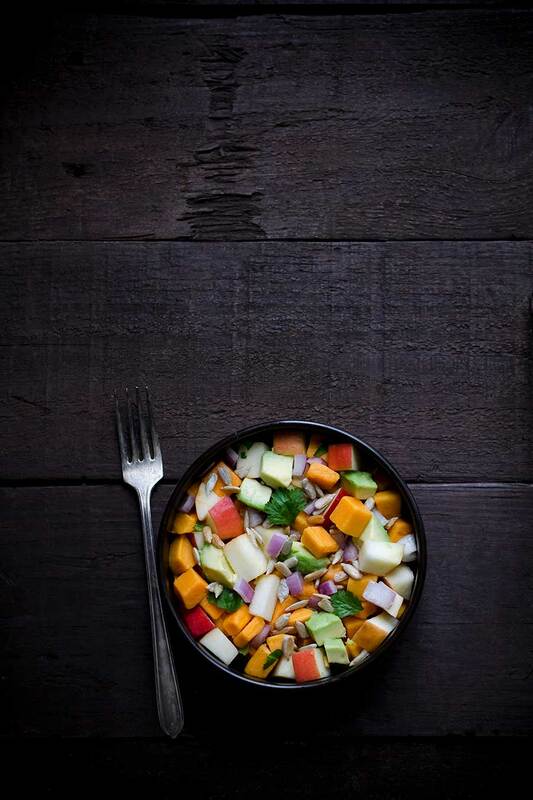 If you boil the sweet potatoes, make sure to drain them well before adding to the salad to avoid watery vinaigrette. I aim to cut the sweet potatoes, apples and avocados into similar sized pieces. It looks nice and the flavors are balanced in each bite. This recipe will work with either sweet or tart apples; use what you have. I like using red apples such as gala since the avocados are green and the onions are purple. It’s pretty! Apples and avocados oxidize (turn brown) after they’re cut into. The lime juice will delay this, but you’ll still want to enjoy the salad within 24 hours (you can probably get away with 48 hours). I always get one question about cilantro substitutions. If you dislike cilantro, there’s no need to substitute another herb. Simply omit it! If you like this recipe, you may also enjoy my Mediterranean Salad with Roasted Tomato Vinaigrette, Chicken Bacon Avocado Salad, and Strawberry Spinach Salad! This healthy sweet potato, apple and avocado salad is paleo, gluten free, grain free and vegan! Bring a large saucepan full of water to a boil and add sweet potatoes. Cook until fork-tender, approximately 10-15 minutes. Drain and rinse under cold water to cool. Drain well. (You can also steam them instead of boiling). Toast sunflower seeds in dry skillet over medium-high heat until golden and fragrant. Combine apple, onion, cilantro, and lime juice in a large bowl. Stir in sweet potatoes and oil; add salt and pepper to taste. Stir in avocado and toasted sunflower seeds just before serving. This salad tastes best the sooner you enjoy it; I recommend serving immediately or preparing it the night before to take as a lunch. If preparing in advance, store in the refrigerator in an air-tight container. The longer the ingredients sit in the dressing, the less pronounced the flavors and textures become. If you don't like raw red onions, try substituting shallots. They're milder, with a bit less bite. I loved this salad! Really flavorful! All that fresh goodness, YUM!!!! This is such a wonderful combination of flavors!